The Macaron collection evokes the pleasure of a perfect food and wine pairing through its gourmet name and its remarkable shape. 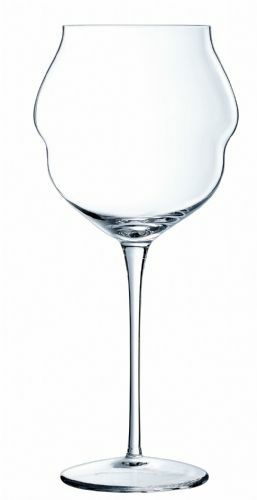 Its bold, rounded contours are ideal for wine. Their potency is reinforced by the two chambers of the glass. The elegant, dazzling shape of the champagne glasses, which are neither fl utes nor coupes, is designed to release the aroma of eff ervescent wines and entice you to have a taste. Distinctive and unique. The design of the Macaron flute offers a striking mid point between a coupe and flute and is nucleated to maximise visual appeal. A cold cut rim complements the rounded upper bowl finish which is designed to hug the lips when drinking. A natural gauge at 125ml is perfect for dining and wine enjoyment. 1: Large surface area for oxygen contact (on average 10% more than a classic tasting glass) for perfect aeration of young wines. 2: A unique aromatic chamber, wider than it is tall and bubble-shaped for less intense but subtler aroma perception. A beautiful fine and seamless stem. Extra –flat base brings increased stability and the reduction of water deposits following dishwashing.